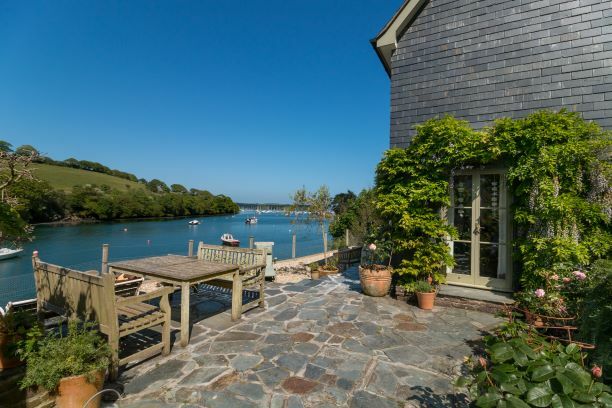 A no through road, Church Road has long been one of the most desirable and sought-after addresses in South Cornwall, and winds its way along the creek from the village of Mylor Bridge towards the yacht haven at Mylor Churchtown. At low tide there is a little beach at the end of Church Road, where the footpath then continues on to the ancient church and yacht haven. The boating facilities at nearby Mylor Yacht Harbour rank as some of the finest in the westcountry, with yacht marina, moorings, sailing clubs, chandlery, riggers, cafe and restaurants, all at the entrance to Mylor Creek where it joins the Carrick Roads, regarded by many to possess some of the best day-sailing waters in the UK. 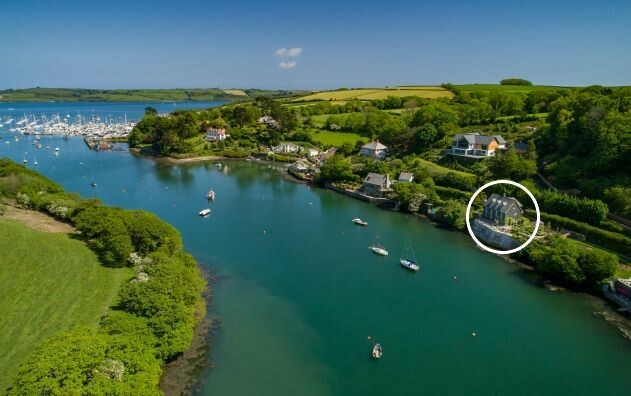 At the head of the creek, Mylor Bridge is a thriving community and has retained a wide range of amenities including primary school, newsagents and Post Office, well stocked village shop with grocers and bakery, butchers, hairdressers, and The Lemon Arms public house. The nearby university town and port of Falmouth is home to the National Maritime Museum Cornwall and Royal Cornwall Yacht Club, and is about five miles drive whilst the Cathedral City of Truro with its mainline railway station is about nine miles away. 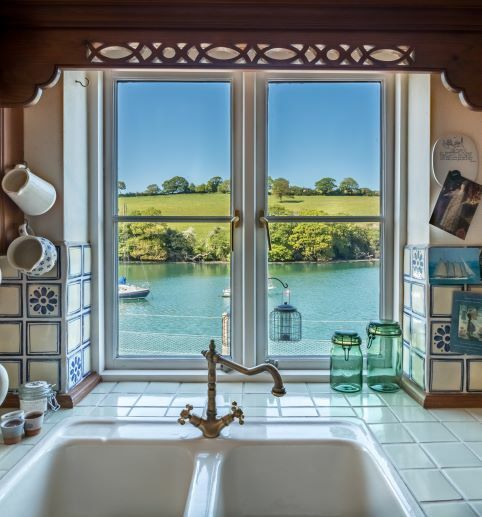 Built in 1988 by the present owners, Otter Cottage occupies an idyllic setting near the end of Church Road, elevated above the creek, with 180 degree water views, taking in the unspoilt countryside on the opposite bank and the moored boats at Mylor Yacht Harbour. On the ground floor a bespoke Smallbone kitchen-dining room has doors at either end opening out to the terraces. One end of the room, currently used as a snug, has an open fireplace which is perfect for winter evenings. The kitchen has built-in Miele appliances, a Siemens hob with a Gegganeau pantry fridge and separate freezer. The adjacent utility room has stable door into the rear garden. The sitting room is on the first floor, as is the main bedroom. Both have dual-aspect views of the water and gardens and ‘Juliet’ balconies on the water-facing windows. The master bedroom has built-in wardrobes and an en suite bath/shower room, with a freestanding roll-top bath and a walk-in shower. 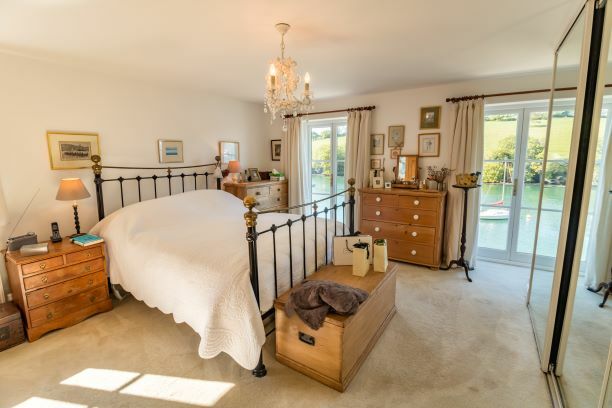 There are three further bedrooms on the second floor, with a family shower room and airing cupboard off the upper half-landing. All of the second floor bedrooms have cleverly utilised under-eaves storage and there are two open storage areas on the half-landing. 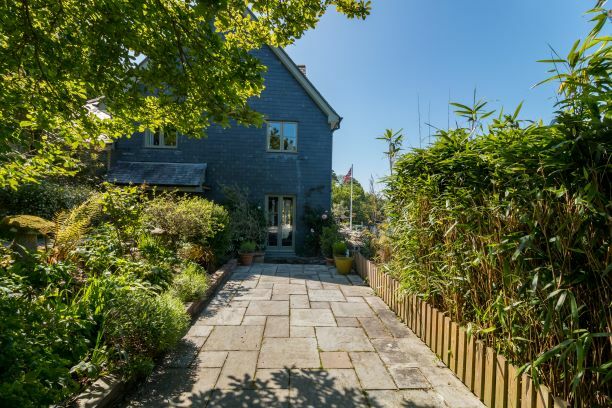 There is a long single-width garage adjoining the rear of the house, with driveway access from the road, and a door to the garden at the other end. In addition there is a further detached garage on the other side of Church Road. 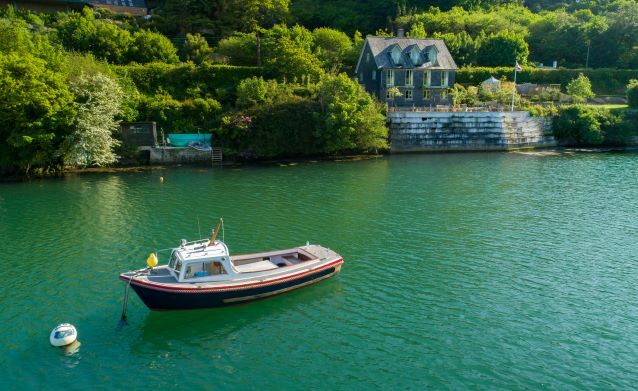 On the private quay is a useful boat store (approx 16' x 8') with a derrick boat lift and steps down on to the foreshore at low tide. Moorings are available on licence from the Council. The terraced gardens and grounds stretch along the creek, and include a lawn, greenhouse and fruit cage, and a series of well-established flower beds with magnolias, hellebores, honeysuckle, roses, wisteria, bamboo and clematis. A stone path leads over the small pond into a second lawned area, where the path continues down to the private quay. From the centre of Mylor Bridge follow the road signposted towards Mylor Yacht Harbour and Flushing. Shortly after the cricket field on the left, take the second left into Church Road. Follow the road along the creek and Otter Cottage is near the end on the left hand side.